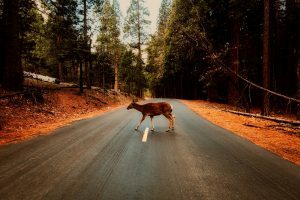 One of the most dangerous driving hazards are animal collisions. Because animals often react unpredictably, drivers can frequently misjudge their speed, direction and distance. Plus, sudden turns to avoid an animal could send a vehicle into surrounding traffic. Use extra caution when driving through heavily wooded areas or near natural sources of water. Slow down if you see an animal near the road. Even if you see it leave the area, be sure to pay attention for others in the area. Apply the brakes if there’s an animal in your path. Swerving could put you in the path of another vehicle or hazard. Turn on your high beams at night so animals are easier to see. Don’t leave your vehicle if you hit an animal. Even if it appears to be lying still, it may still be alive and potentially dangerous. Instead, call your local police department or the state patrol.